Brief Synopsis – Two sisters join the first all female baseball league during WWII and must try to help it succeed despite their personal differences. My Take on it – I love baseball and this movie tells the story of the first all women’s professional baseball League that was created when many Baseball players signed up and went off to fight in WWII. The story here is a fictionalized version of what really happened, but it heavily uses true events within it’s storyline. 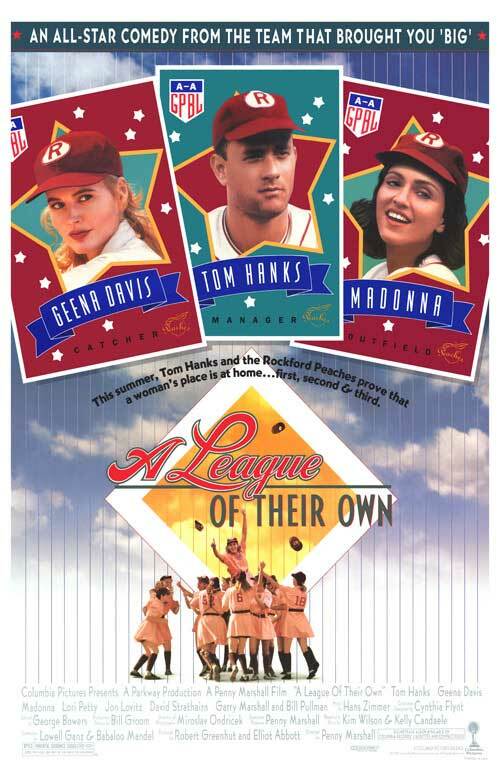 Geena Davis and Lori Petty plays baseball sisters who’s love for the game end up starting a rivalry between the two. This movie faithfully shows the change in societal thinking at the time which would eventually allow for women to join the regular mainstream work force and allow women to start their own careers and not feel “delegated” to only staying at home. This movie may be about women’s baseball, but the two scene stealers here are both male – Tom Hanks as a cranky baseball manager and Jon Lovitz as a baseball scout are both excellent here. This movie also shows the emotional toll that these women carried with them since they were constantly dealing with the fact that their loved ones were off fighting a war overseas. The final scene in this movie always makes me cry and I think it’s because we get to know some of the characters so well during the course of the movie, that we are “touched” by their emotions. This “punch” truly elevates this movie. Bottom Line – Great movie. Not only is it about baseball, but also gives an emotional “punch” making this movie worth watching. Highly Recommended! Though I think it suffers from the same plaque that hits 2013: using baseball to over-demonstrate societal growth in recognizing and valuing equality. Both movies, I think, go too far in the end, make it seem like everything was fixed in the 1940s and life is now grand for those who were once underprivileged. Here it is a smaller complaint, though, because, on balance, this film is more interested in character development. Did you mean 42 (2013) J? Yeah. Sorry, missed a word or two. Meant to say 2013’s 42. nice!!! do u know ppl who were extras? Oh I have no idea…Haha. I was pretty young when they were here. I just know they filmed at least some of it at Bosse Stadium, which is literally like 15-20 minutes from where live. Great review, This Used to be my Playground is such a heartfelt and beautiful song. most definitely Vinnie. Love that song, great message about memories. I think that Now and Forever is slightly better, but both are great.